Surrounded by mountains and tropical gardens, on the island's best preserved bay, Le Meridien L'Habitation was designed in the traditional Caribbean style. The hotel's tastefully decorated bedrooms and Suites are complemented by four restaurants, three bars, a sports centre, two swimming pools, a marina. In a contemporary Creole Style, each room is dipped in the bright, fresh colours of a Caribbean palette with luxury bedding, throw pillows, drapery treatments and artwork. All the rooms are spacious and accommodating with every anticipated amenity. Furniture is hand-crafted in Malaysia and all room sare appointed with today's conveniences such as direct dial telephone, television, minibar, individual control air conditioning and luxurious bath amenities. A private terrace or balcony opens to the beckoning breezes, luring guests to al fresco refreshments. 950-square foot rooms equipped with King-size beds, separate sitting rooms, television, hairdryer and private safe. Bathrooms equipped with bathtubs with showers, separate toilets, double sinks decorated in marble. In addition, sofa bed in sitting room. 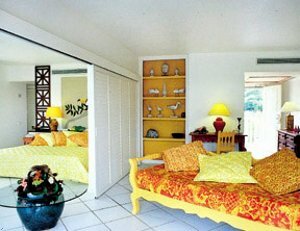 Suites can accommodate up to three per person or two adults and two children. As above. 420 square feet, room equipped with two double beds or one King-size bed. In addition sofa bed in sitting room. As above. Room overlooks manicured gardens. As Le Habitation Suite. 850 square foot Suites equipped with two twin beds or one King-size bed, separate sitting room with sofa bed that accommodates one adult or two children, fully-equipped kitchen, television, hairdryer and private safe, separate toilets, double sinks decorated in marble. French Creole and gourmet Ã la carte (fish). Theme - French colonial/local tradition, pastel colours and designs. Dress code - smart - casual. Mediterranean. Theme - French colonial/tropical. Dress code - casual. Breakfast, restaurant buffet. Theme - French colonial / pastels and bright colours. Dress code - casual. Theme - French Colonial, nightly piano music. Dress code - casual. Sporting facilities include: Jogging track/trail; Outdoor swimming pools; Tennis - outdoor; Squash; Racquet ball; Gym; Watersports and spa.